Origin and Habitat: Brazil (Rio Grande do Sul) and nearby Paraguay, Uruguay, Argentina . It has a small range (extent of occurrence is 2,600 km2) and it is severely fragmented. Altitude: It occurs at elevations of 150 to 800 meters above sea level. Habitat: This species grows in hilly grassland and on walls between cracks in the rocks or in the shade of larger growing plants in deciduous forest. It grows in one of the most temperate region of the countries with warm and cool seasons and weather can become very cold during the winter nights, often it will fall to just above freezing without harming the plants as it is also very dry. The soil there is well drained and has a fairly high organic content, derived from the decomposition of other plants. Parodia magnifica f. aurata hort. 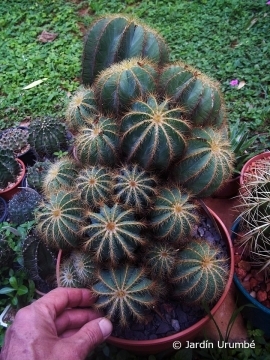 Eriocactus magnificus f. aurata hort. Notocactus magnificus f. aurata hort. 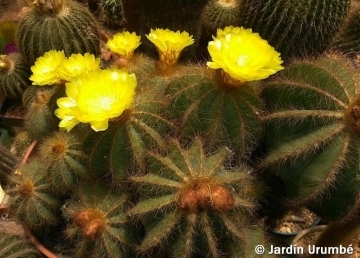 Description: Parodia magnifica, still known in cultivation with its old name Eriocactus magnificus, is a bluish-green geometric globular cactus with wool that grows in clusters and produce absolutely brilliant yellow flowers. 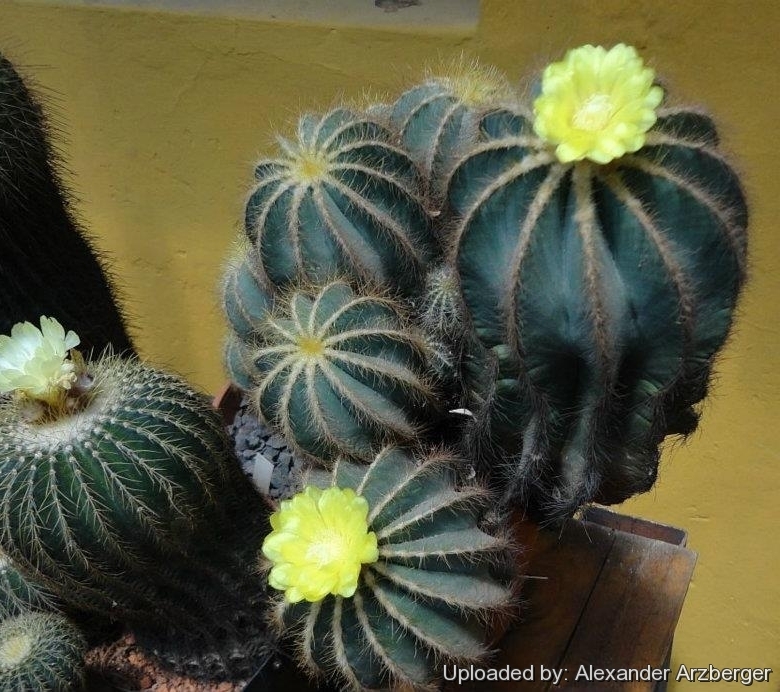 These cacti develop a slight depression on the crown, which may become distorted with age. Parodia magnifica glistens under a haze of pale yellow spines. Cristate (wavy edged) forms are avalible but these are usually grafted plants. 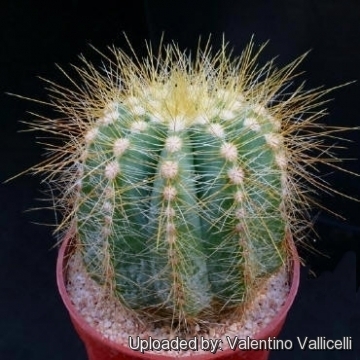 Similar species: It resembles very well to the Parodia warasii (= Eriocactus warasii). Habit: Plants at first solitary, forming large clustering mounds in time. Stems: Globose, becoming short cylindrical with age, blue- green, glaucous, oblique apically. It grows 30 (or more) cm high and 7-15 cm in diameter. Ribs: 11-15, straight, symmetrical, acute. Areoles: White at first, later yellowish close together or almost contiguous. 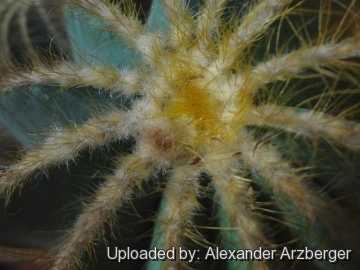 Spines: 12-15 or more, bristle-like, thin, flexible, goldens yellow, 8-20 mm long. 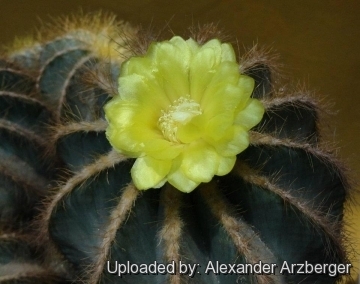 Flowers: Borne several at a time apically, funnel-shaped, sulphur yellow, 4,5-5,5 cm long and in diameter; pericarpels with dense white wool and brownish bristles. Blooming season: Flowering occurs in summer through early fall and will bloom several times during warm weather. Fruits: Globose, pink, to 1 cm in diameter. Seeds: Obovoid to club shaped, reddish brown, spiny tuberculate. 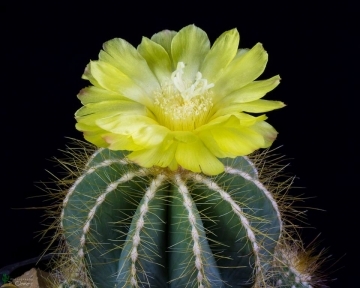 Parodia magnifica f. aurata hort. : Mutant completely lacking chlorophyll pigment. The result is a completely cream-white, yellow or reddish plant. 7) Larocca, J. & Machado, M. 2013. Parodia magnifica. In: IUCN 2013. "IUCN Red List of Threatened Species." Version 2013.1. <www.iucnredlist.org>. Downloaded on 29 October 2013. 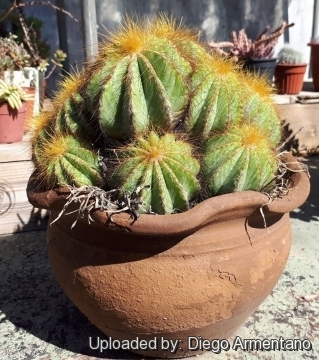 Cultivation and Propagation: Parodia magnifica is an easy to grow ornamental species suited for any well drained soil in half or full sun. Soil and pots: It likes deep pot with generous drain holes, needs a very airy potting medium very permeable to water which mainly consists of non organic material such us clay, pumice, lava grit, expanded slate and only a little peat or leaf-mould, slightly acid, pH-value between 4,5–6. Re-pot every two years. Exposure: This plant need full sun but tolerate moderate shade, and a plant that has been growing in shade should be slowly hardened off before placing it in full sun as the plant will be severely scorched if moved too suddenly from shade into sun. Watering: No water should ever be allowed to stand around the roots. Keep almost completely dry in winter. However this spurge will tolerate dryness and can even thrives in poor, dry soils, but do better when grown in nutrient-rich soils with regular watering. Hardiness: Tender. 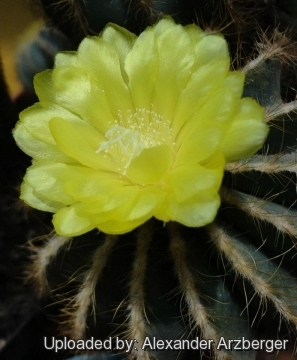 This cactus cannot tolerate any frost and can be difficult to get it to look its best without a good amount of heat. It can be grown outdoors in frost-free climates. Rot: Rot it is only a minor problem with cacti if the plants are watered and “aired” correctly. If they are not, fungicides won't help all that much. Propagation: The plant can be reproduced by seeds or cuttings. The plant may be propagated by branch cuttings. If you remove an offset, remember to let it dry for some days, letting the wound heal (cuttings planted too soon easily rot before they can grow roots). Lay it on the soil and insert the stem end partially into the substrate. Try to keep the cutting somewhat upright so that the roots are able to grow downward.